Gillespie et al (1976)  reported urticaria, angioedema, asthma in a study of 18 patients allergic to tree nuts. Note that more than 20 patients are reported as allergic to pecan (see below) but their symptoms are not described separately from those due to other tree nuts. Pecan and a pecan containing cookie (Malanin et al. 1995 ). Prick-Prick, moistening the pecan with saline. 10 mM histamine dihydrochloride was the positive control. Number of Patients:Malanin et al. (1995)  tested one patient. Malanin et al. (1995)  found that the patient reacted only to the cookie or pecan nuts from the cookie (5x5mm) rather than to raw pecan. Malanin et al. (1995)  extracted fresh, heated and stored pecan nuts with 150 mM NaCl and 3 mM NaN3 (1:10, w/v) and coupled to CNBr-activated filter paper disks. Sicherer et al. (1998)  used a commercial extract. Summary of Results:Sicherer et al. (1998)  report that 11/111 patients who reacted to pecan had a mean specific IgE of 18.3 kU/l while 10/111 peanut or tree nut allergic patients who had eaten pecan without a reaction had a mean pecan specific IgE of 1.6 kU/l. Immunoblotting is only described in a preliminary report (Teuber SS, Sathe SK, Roux KH, Peterson WR. J. Allergy Clin. Immunol. 105 (1), S424). Sicherer et al. (1998)  report that pecan is the second most common tree nut allergy in peanut allergic patients after walnut (13 pecan allergic/54 tree nut allergic/102 patients). Roux et al. (2003)  and an abstract (Teuber SS, Sathe SK, Roux KH, Peterson WR. J. Allergy Clin. Immunol. 105 (1), S424) report that there is complete IgE cross reactivity by immunoblotting between pecan and walnut. Many studies report allergy to "tree nuts". Allergy to pecan was the fourth most common of the tree nuts allergies reported by Sicherer et al. (2001)  with 9% of the 1667 nut allergic registrants reporting pecan allergy. Similarly Sicherer et al. (1998)  report 13/54 nut allergic patients as pecan allergic. However, the symptoms, described as 89% involved the skin (urticaria, angioedema), 52% the respiratory tract (wheezing, throat tightness, repetitive coughing, dyspnea), and 32% the gastrointestinal tract (vomiting, diarrhoea) were not associated with specific nuts. In the UK pecan may not be as common a source of tree nut allergy with Clark and Ewan (2003)  reporting 8/1000 patients showing their strongest reaction to pecan based on clinical history (however, the number of patients who tolerated pecan was not reported). Malanin et al. (1995)  and Berrens (1996)  report a neo-allergen, which appears on storage (>2 weeks) of pecan nuts and products containing nuts. They suggested that a Maillard reaction product might be the allergen. Anaphylactic reaction caused by neoallergens in heated pecan nut. 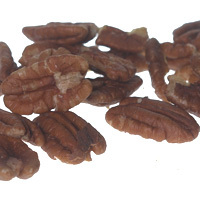 Neoallergens in heated pecan nut: products of Maillard-type degradation?